It’s been calculated that the odds of finding a four-leaf clover are 10,000 to 1 (Bradley, 2008) … those are some steep odds indeed! 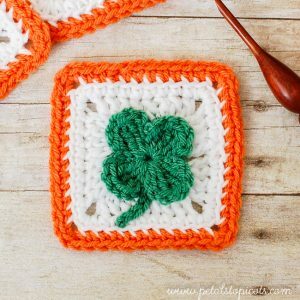 But we can make our own luck by stitching up as many as we’d like with this free crochet clover afghan square pattern! Finished square measures approximately 4¼ × 4¼ in. CA = green; CB = white; CC = orange. Make a magic ring with CA (if you prefer you can ch 4 and join in furthest ch from hook to form a ring). 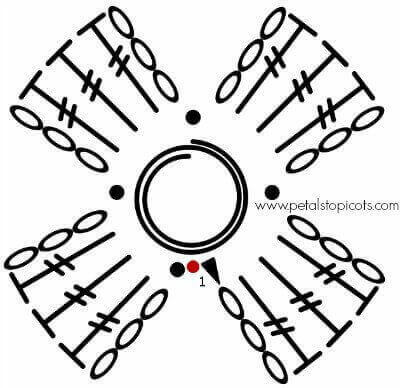 Round 1: *Ch 3, work 3 tr in ring, ch 3, Sl st into ring, rep from * 3 more times, do not turn or fasten off — 4 tr-groupings. Round 2: Working behind the stitches in Round 1, ch 5, Sl st in next Sl st, rep from * 3 more times, ch 4 and fasten off — 4 ch-5 loops and a ch-4 tail (clover stem). Round 3: Join CB in 1st ch-5 loop, ch 3 (counts as dc), work [3 dc in, ch 2, work 4 dc] in same ch-5 loop, *work [4 dc, ch 2, 4 dc] in next ch-5 loop, repeat from * twice more, join in top of beginning chain keep the ch-5 tail from Round 2 in front of your work — 32 dc and 4 ch-2 spaces. Round 4: Ch 1 (does not count as st), work 1 sc in same st as join and each of the next 3 sts, work 3 sc in next ch-2 sp, *work 1 sc in each of the next 8 sts, work 3 sc in next ch-2 sp, repeat from * twice more, work 1 sc in next 4 sts, join again keeping the ch-4 tail from Round 2 in front of your work, fasten off — 44 sc. 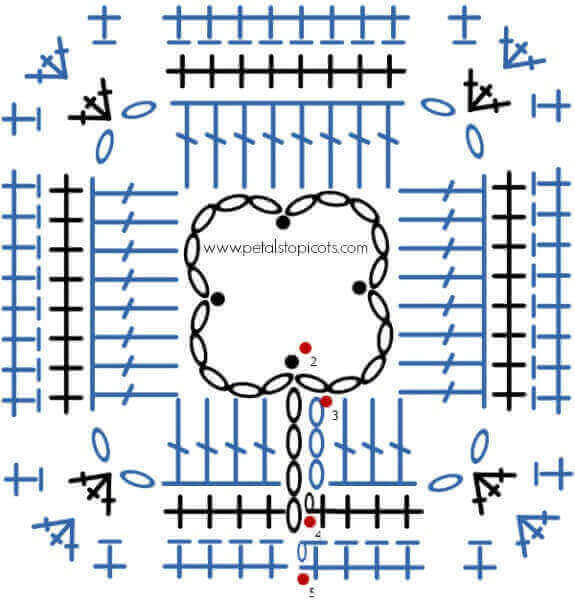 Round 5: Join CC in same st as join, working back loops only this round, ch 1 (does not count as st), work 1 sc in the same st as join and each of the next 4 sts, work 3 sc in next st, *work 1 sc in each of the next 10 sts, work 3 sc in next st, repeat from * twice more, work 1 sc in next 5 sts, join — 52 sc. Position ch-4 tail from Round 2 (the clover stem) as desired and weave tail to back of square and secure. Weave in ends, block if desired. 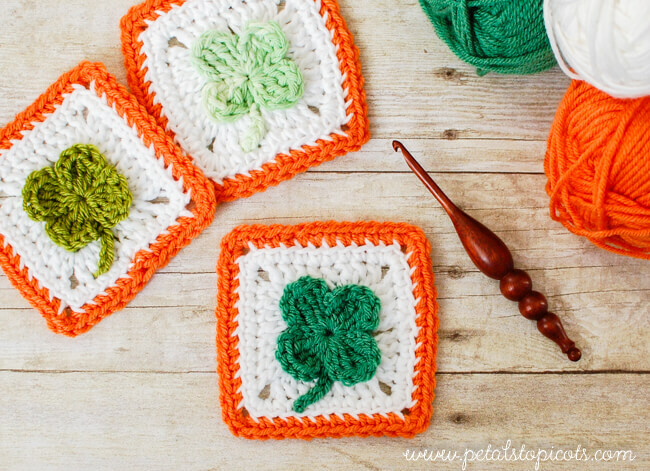 Click here for more free Saint Patrick’s Day crochet patterns. I really don’t understand your round two at all. Could you post a video of what it means? I can’t seem to find this pattern. I’ve clicked on the links but the sites don’t seem to have the pattern. Help! Thank you so much for this pattern! It’s exactly what I was looking for! On Round 2 it says “sl st into next sl st” am I using a new color at this time? I am so confused. Thanks for the free pattern! Question on Round 3, the written instructions say “ch-4 loop” several times, but is that supposed to be ch-5 loop? On the previous round you work four ch-5 so that is a little confusing to me. Am I missing something? Thanks again. Hi Sarah 🙂 No, you aren’t missing anything. That was a typo on my part. It should say ch-5 loops. I corrected it in the pattern. Thanks for letting me know! fore. I was looking for a pattern too. I can’t read charts. I was fine with this pattern until I saw the chart. 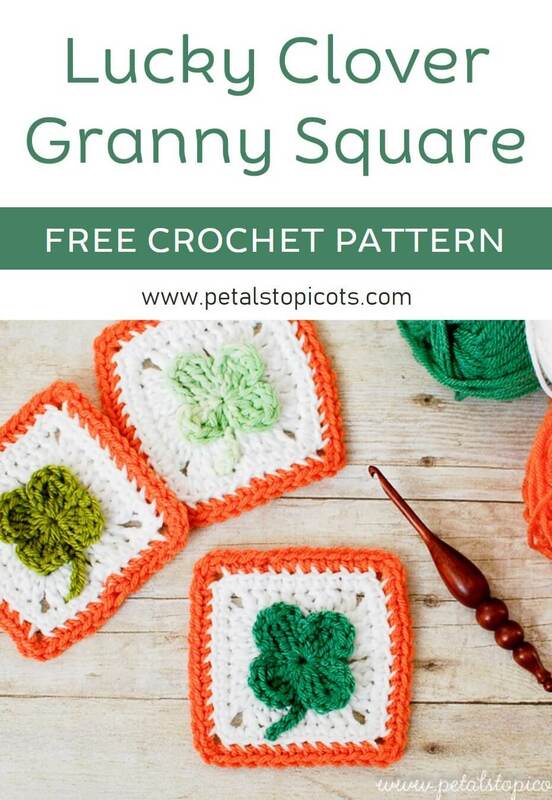 I will never make these squares! I totally Hate charts! You do not have to use the chart. I provided BOTH a pattern and a chart because I understand that people have different preferences. on round 2, what does slip stitch into next slip stitch mean?